We continued our journey through Sydney’s neighborhoods after lunch. From Bondi–where an unrenovated beach view home or condo starts at $2 million and you pay $4 million and up for one that’s been remodeled–we moved a bit inland to districts like Woollahra and Paddington, where row houses built in the 1800s have elegant wrought iron work gracing the balconies. As we drove Suzanne pointed out places of interest and continued to educate us about both Sydney and Australia. What follows is a mish-mash of info that we liked. Australia became a federation of states in 1900. Sydney and Melbourne both wanted to be the capital. Instead, a new city, Canberra, about halfway between, became the capital. The federal system is stronger in Australia than in the U.S., where states play a larger role. There is greater support of infrastructure from the central government; as a result, there are no state or local taxes. About 40% of children go to private schools. Except for a handful of private universities, all higher education is pubic. Tuition is about $10,000 Australian a year, with federal loans available. In many other areas of the city, public housing apartments have now been converted into luxury condos. The average price of a home in Sydney is now $1 million Australian, about $750,000 US. It’s becoming increasingly difficult for the younger generation to afford to live in the city. Sydney now has many high-rise buildings. One major development is the $6 billion Aus. Barangaroo Project, a multi-use development with residential and commercial space. 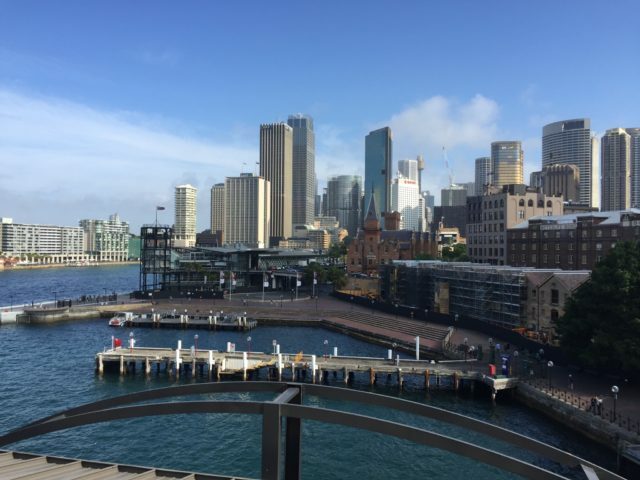 It is part of a campaign to make Sydney the financial capital of Southeast Asia, to replace Singapore and Hong Kong. Australia has had restrictive immigration policies for quite some time, in part because of water scarcity. At one time it was limited to 100,000 a year, although you must take into account the small size of the population of Australia, only 24 million today. Skilled workers comprised 60%, family reunions 30%, and political refugees, 10%. Today the limit is about 200,000, and Australia takes in more refugees per capita than any other country. Now for another food-related stop. (Suzanne figured out what we liked early on!) Victor Churchill is a butcher shop like no other! Talk about high-end! And really, the correct term is probably meat purveyor. Look at the prices! Aus$299.99 per kg (2.2 lbs) for the 600+ day aged Wagyu! Or perhaps the more reasonable Wagyu fillet at a mere $109 is more to your liking? By mid afternoon the sun finally came out, greatly improving my photos. We drove back through the extensive Botanical Gardens for better views. Isn’t the trunk of this very old Moreton Bay Fig tree a work of art? See the Sydney Harbor Bridge in the first photo below? A popular activity (that we opted to skip) is the Bridge climb. I had thought it would be a straight upward stairway. Nope, for a mere Aus.$250 per person, they fasten you into a rig and you climb up the outside curved portion. You can see it in these close ups I took. Not for the faint of heart! This group successfully reached the top of the Sydney Harbor Bridge! We returned to the hotel weary but wiser after a day with Suzanne. PS–Writing these blog posts on the iPad has been slow going; they take hours, as formatting photos and text is really tough. I’m trying hard to keep up, even though my updates may reach you a few days after they happen. As per usual I am enjoying your descriptions and photos of your experiences. It’s worth the “tough going” that you have to put into each post. Thank you. Thanks, Lois. I appreciate your letting me know. As a blogger yourself, you know how much time it tales! I think I’ve figured out how to get the posts done more quickly, though. Let’s hope so! I’m doing FB as well, Linda.. however, many of my friends and family aren’t on FB….doing the email version as I used to was way easier. I figure that eventually I will figure out some shortcuts or plug-ins to help with WordPress. Fun to see Moreton Fig tree in home of origin. There is a beautiful one, wider than one pictured, at Balboa Park. Yes, and there were similar,y large ones here as well. I loved the pattern the trunk made on this one. It’s equally expensive there for housing as it is here. I feel sorry for the next generation. Yes, it’s similar to what we are seeing in CA. Melbourne is more affordable, as you’ll see when I get to that post!